Materials: 14K white gold, a 0.236 x 0.118 inch (6x3 mm) marquise-cut emerald set in a 14K yellow gold bezel in the ladies' ring. These elegant white gold relation rings are titled niigiwin manidoowan, which means “growth is a mystery” (lit. : “birth mystery”). The design of the rings tells a story of the physical and spiritual bond between two lovers. In a broader perspective, however, the rings represent the organic commitment between a couple and the primary sources of life: our mother the Earth and our father the Sky. 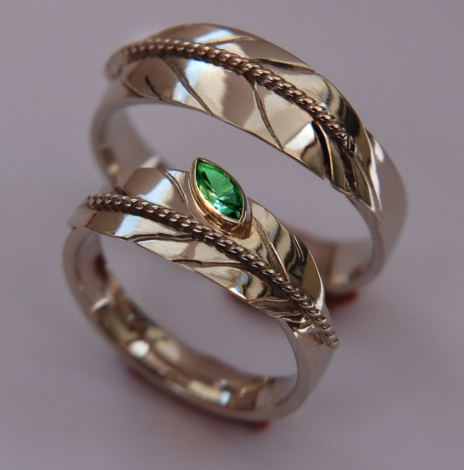 In a way, the combination of the symbol of the eagle feather and the color of the green emerald (which stands for growth) in the woman’s ring tells a story of the person wearing it. The 0.24” X 0.12” marquise-cut emerald, mounted in a yellow gold setting, symbolizes a miinikaan (seed); the precious stone stands, in color and form, for the fertile earth in springtime, when the seeds sprout forth from the earth and life returns to the land. It also epitomizes the first sound of creation, and the time of morning. The stylized white gold eagle feathers adorning both rings suggest the omnipresence of the sky and the light of the eastern direction and, in a metaphorical sense, the spiritual quality surrounding us in life. All these entities, earth and sky, birth and rebirth, the magical connection between the material and the immaterial, fertility and the light of the day, come together in the design and represent the deep and organic love that two people feel for each other. 'The small seed is a mystery. The small seed symbolizes a child. - Ritual words of thanksgiving in the Autumn ceremony of the Waabanoowiwin, Anishinaabe Society of Dawn, when a kernel of corn is planted as a symbolic petition for Life and Health.